With the seventh Digivolving Spirits figure out in Japan it made sense to open the discussion thread for the figure. 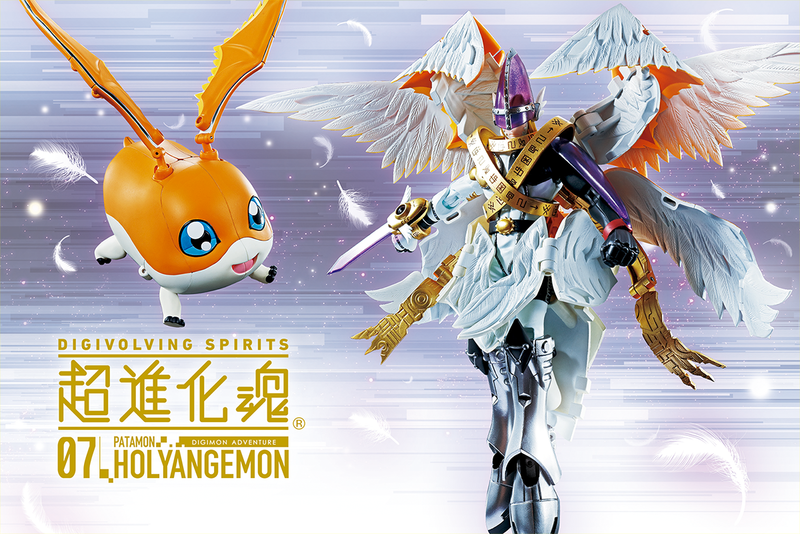 HolyAngemon is a figure we first saw in art form over a year ago, and it was quite awhile until he was confirmed as coming out. In addition, with the release of this figure we are past the halfway mark on one of the stated goals of the line, having the lineup of all 8 partner Digimon from Adventure. Hi Marc, I have had this question for a long time. I've been wanting to buy digimon merchandise online for a while now and was waiting till I got a job to actually begin, and I was wondering. If I bought the merchandise from Amazon does that support Bandai and Digimon directly? Or Is there another place I can purchase where it would actually support them and not whoever owns the site or seller. Sorry for the comment not being directly about the HolyAngemon Digivolving spirit. The only partners we need left from Season 1 are Garudamon, Lillymon, and Zudomon. Especially the latter two who never got figures in this style at all. I wonder if they’re willing to do Frontier figures, with the Spirit Evolution feature? I've been on pins and needles for over a year now just hoping the line doesn't end up dying before Lilymon and especially Zudomon get released. The fact that we're still getting new designs like Beelzebumon shown off give me hope, though. On the subject of HolyAngemon, I won't be getting mine until the US release next month and I'm still totally on the fence about how I feel about him. He doesn't look like an absolute home run of a figure in the way that WarGreymon, MetalGarurumon, and AtlurKabuterimon do in both forms, but he also doesn't look as bad as I've always thought Angewomon does in both forms. Something about his wings, though, especially the ones around his waist, just seem off. Hopefully he'll click more once he's in hand. Had mine lying around for a bit, but finally found the time to play around with him. Great figure. Miles better than MegaKabuterimon, who I was kind of disappointed by. The wings are a bit chaotic and hard to pose right, but you can get some pretty good ones out of it (and they include a nice, non-obtrusive bit for a Figuarts stand, which is delightful). But the real star is Patamon, who's just freaking adorable. Even with the seams, it's just a great transformation.I am a tad worried about quality longevity; everything on Patamon is matte, and the wings have lots of pointy, scratchy bits. But definitely worth the purchase. Up next is a fun recolor, and then... something? Please? Are his wings removable like angewomon? Next time I think I will pre-order from big bad toy store I pre-order from Amazon this time and they do not plan on taking it the money from my account out till the 14th and It should be delivered the 19th But I am seeing some people got their already. Last edited by jaws_is_ra; 03-12-2019 at 08:46 PM. I received my Magnaangemon Yesterday. It looks amazing, kinda hard to pose with all the wings being every where. Now that i have Magnaangemon i'm obviously looking forward to Garudamon, lillymon and Zudomon, but am i the only one worried with the lack of news? Looking at the release dates they were coming out every 2 months uptill black wargreymon, but we've also haven't had a proper reveal of who is next. I'm mostly worried because Tamashii has a habit of showing us stuff and then never show or speak of it ever again.